But now Aussie’s finest Doom Metal band are back with their eagerly awaited new album – Gather Your Beasts. Gather Your Beasts is a heavy based masterpiece from start to finish. Clagg may have written their finest album to date. The 5 tracks on offer here show that Clagg have lost none of their heavy magic. 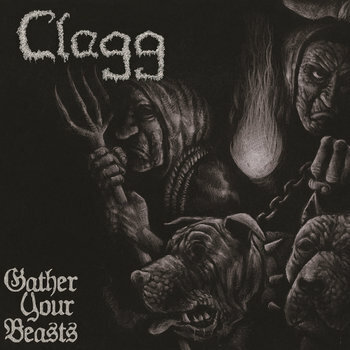 Clagg can now be considered elder statesmen of the Aussie Doom Metal Scene. The album cover shows what to expect from the album for the next 46 mins or so. Mainly top-notch doom and gloom riffs with Clagg on fine demented form through out. First track – Five Curses – is an almost 12 minute epic showing nothing much as changed in the realm of Clagg from their last album. Vocals are screeched at you with demented twisted passion that we come to expect from this great band. It is still good that Clagg throw in some excellent groove based riffs from time to time and to prove they are not all about the darkness. They are mainly about heavy doom based riffs for you will instantly lose control over. If you have not heard of Clagg before then where have you been over the last decade or so? Now is the best time to introduce you with this great band. Imagine a heavier and more dangerous version of Conan or Church Of Misery and that is what you get with Clagg. The band lay down some of the finest riffs of their career on the excellent title track. 8:22 minutes of furious pure riff-laiden greatness here folks. I couldn’t get enough of this track as it mixes the heavier elements of Clagg’s Doom/Sludge Metal riffs with the more groove based and laid back Stoner Metal riffs, that gives this track the perfect balance of good Vs evil. Clagg carry on this superb style of riffs through out the remainder of the album. Even though the album is very dark in places, you cannot but help rocking out to it. This is due to the excellent blues/hard rock vibes Clagg include on the albums later tracks. If you are a long-time fan of Clagg, you are going to love this album as I did. The band should be proud of this album as I feel it is their best album to date. Just sit back and enjoy the awesome riffs that Clagg have delivered here. Gather Your Beasts is a truly stunning album from Australia’s Premier Doom/Sludge/Stoner Metal band. Clagg have never sounded better than they do on this album. The production is immense through out. Gather Your Beasts is another outstanding album from this truly great band. Thanks to the band for sending me a promo copy to review. Gather Your Beasts is available to buy from BandCamp now.